We are seeking to appoint a pro-active Receptionist with a ‘can-do’ attitude to provide an outstanding, friendly and professional service to visitors, students and parents of the school. The role is for 41 weeks per year, covering EMS term-time plus additional core weeks at busy times of the year. A total of 24 hours a week is available which may be shared between two candidates or taken by a single applicant. 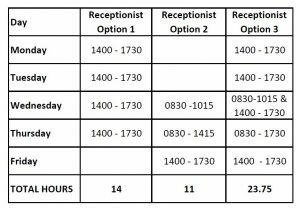 Please review the working hours below and indicate which option suits you when you apply. If you would like the opportunity to discuss this post or visit the school, please get in touch by either calling 01392 429020 or emailing jobs@exeterms.ac.uk. (EMS will be closed from Monday 15th – Monday 22nd April during which time the email and answerphone will not be monitored). To apply for any current vacancy, please complete both the EMS Employment Application Form and the EMS Personal Details Form and email them to jobs@exeterms.ac.uk. Due to our expanding outreach work we anticipate needing an additional Teacher of Mathematics to join us from September 2019. The post, which will be advertised after Easter may be part time or full time.